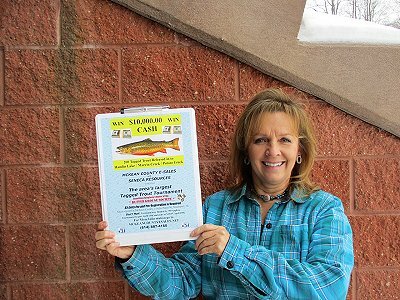 All anglers wishing to claim any of the prizes from tagged trout they catch must register, in advance of the trout tournament, in person at McKean County E-Sales at 311 West Main Street of Smethport prior to 7:59 a.m. of Saturday, 4/13. 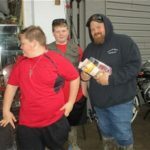 The trout tournament officially starts at 8:00 a.m. on Saturday, 4/13, and anglers must be registered in advance to be eligible to claim any prizes. “Over the years, the tagged trout tournament has benefitted multiple non-profit organizations, and now we have partnered with the Ruffed Grouse Society,” says Perry Burdick, owner of McKean County E-Sales and organizer of the trout tournament. The main fishing hole for the trout tournament will be at Hamlin Lake in the hub of Smethport, but tagged trout will also be stocked into Marvin Creek and Potato Creek. The opening day of trout season is a community affair, so this year at the trout tournament, anglers will also be able to enjoy themselves at the community event with hot chocolate, donuts, dogs, and drinks; gun raffle tickets; and 50/50 raffle tickets. Anybody or any other organization that wants to help with a financial donation or a prize for a tagged trout should contact Brenda Walker at brendawalker@hughes.net or go to the McKean County E-Sales Facebook page for more information as the event nears. 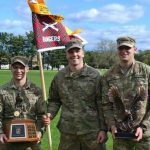 All donors of funds or any prizes will receive verification from the Ruffed Grouse Society, a 501-c-3 organization for tax purposes, a supporter decal, and recognition at the event.